Who should be the next coach of Montana? The University of Montana announced on Sunday afternoon that head football coach Mick Delaney will be retiring as head coach at the end of the season. Delaney was brought on to coach the Grizzlies after Robin Pflugrad was fired by president Royce Engstrom after several legal problems arose on the football team. Athletic director Jim O’Day was also fired at the same meeting. Delaney brought a calm to the Grizzly program in keeping the program clean, as well as coaching the team to a few victories. In the midst of Mick’s retirement the Griz are now looking for a new head coach to fill his shoes. Kent Haslam says he will take his time in finding a new head coach so that he can make the right hire and recruiting can continue and assistants can find new jobs (if necessary) and a full staff can be brought aboard following the conclusion of the Griz’s football season. At this point you have to think that Kent Haslam has a short list of candidates that he would like to contact regarding this open position, and knowing Kent I’m sure he’s furiously searching Monster.com and the eGriz forums to find the next head coach, but in case he needs a little help Brint and Brad decided to put together our own short list of coaches that Montana should consider to take the keys of the Cadillac of the FCS and keep it on the road. In order to be the next head coach of an elite team they need to be able to recruit the Pacific Northwest, need to have a pretty thick skin (afterall, this is the Alabama of FCS we’re talking about), and needs to be able to win the in-state recruiting battle for the state’s top recruits. If a coach can do those things at Montana then they should be able to generate a good amount of success. Brint’s three choices on Montana’s next head coach expand a little bit beyond the regular mind-set of what most fans would initially think of. Many fans will snap back to the thought that we should hire back Pflugrad, bring back Bobby Hauck, or woo Dave Dickenson. I highly doubt the same president that fired Robin would welcome him back just 3 years later. Getting to know Bobby just a little bit I really doubt that a guy with as much confidence (cockiness?) as him would consider coming back to Montana after he moved on. Finally as for “Super Dave” he’s already considered the heir-apparent in Calgary and a hot commodity in the CFL ranks, where he could earn between $400,000 to $800,000 annually. You mean to tell me he would come back to Montana to make a fraction of that and coach in a system he’s not familiar with anymore? I just don’t see any of those options as realistic. Here’s three you may or may not have thought about but could be very real options for the next Grizzly head coach. Kraig is a former Griz and someone who has worked with multiple head coaches here at the University of Montana. He’s coached just about every position on the defensive side of the field and once wore the legacy #37 for Montana as a fullback. Paulson was assistant head coach for the Grizzlies under Bobby Hauck and continues to serve in that role with Hauck at UNLV. While at UNLV he was demoted from DC to linebackers coach and things are once again not looking so bright for Hauck and his staff. Last year the Rebels made it to a bowl game but this year they’ve won just 2 games. One can’t help but wonder if Paulson would be looking to return, once again, to his alma mater this time as the head coach. He presumably would work well with our current DC, Ty Gregorak – a prior linebackers coach and protégée under Paulson for years. Paulson’s defenses at Montana lacked the aggressive flashiness but made up for it with solid execution and preparation. Rarely did Montana have a bad or even a mediocre defense under Paulson. Also Montana’s last Buck Buchanan winner, Kroy Biermann, played under Paulson’s time as DC. Paulson would need to find a highly experienced OC to the table as I presume he would find a more comfortable fit in the defensive side of the ball. A former Grizzly player and a rising name within the ranks Thompson has spent most of his coaching career in the Big Sky, at Northern Arizona. If Griz fans are looking for a more aggressive style of play and creativity then look no further than the product Thompson has put together. He is the current defensive coordinator for NAU and has held this position for the last 6 years. He has experience coaching on both sides of the ball in a few different positions as well. He would certainly bring a much more youthful energy to the program. I’m not sure where he would build his staff from though, there could be options around the conference of some assistants to build off of. Thompson played for the Griz during the years of Joe Glenn and Bobby Hauck – he was on the national title team of 2001. Thompson would certainly understand the pride and tradition of what it means to be a Grizzly yet he would return to the team with plenty of “outsider” experience that could breathe some fresh energy into the program. Remember him? He was a highly successful head coach for years at Central Washington. I believe he applied for the head coaching job at Montana back in 2010 and made a good impression, but we eventually hired Pflugrad. Zamberlin had a real rough go of it in the Big Sky though, leaving CWU to go to Idaho State, where he bombed out after 4 years. After that he was a d-line coach at Weber and is now a linebackers coach, special teams coach, and player scout in the CFL. Zamberlin has also coached at EWU, Richmond, and UMass as well has having played in the NFL for a little while. In the coaching ranks some might say he’s a little older at 58 but he brings a world of experience at the job and knowledge of the conference to the table. When at CWU he won multiple coach of the year awards, had a few wins against Big Sky teams (including the Cats), and continually had his football squads finishing top in conference wide academics. His CWU teams were very well balanced squads for the most part, in his tenure there I believe he made the division 2 playoffs 6 of the 10 years he was there. Bob Stitt is the current head coach for the Colorado School of Mines in Golden, Colorado. Stitt has been the head man at School of Mines since 2000. Before that he was the OC at Harvard. He played running back for Doane College and was the college player of the year in 1985. He holds a 90-57 at Mines, and and 1-2 record in the DII playoffs. Stitt became more of a household name during the 2012 season after West Virginia head coach Dana Holgorsen credited him for the fly sweep that the Mountaineers abused Clemson over and over with during the Orange Bowl. He brings a spread offense that he claims is very quarterback friendly. This works out well for Montana who will be breaking in a new quarterback next season. Stitt is also a firm believer in 4th downs, who as of mid-October had gone for it 25 times and succeeded in 19 tries. He would bring the kind of offense to Missoula that fans crave, but can he find a defensive coordinator to keep every game from being a track meet? Can his offense really succeed at any level? All legitimate questions. 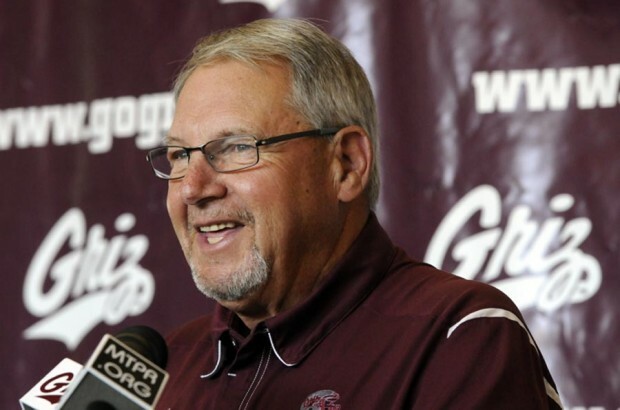 The last time the Griz hired from the lower ranks they landed Joe Glenn. That worked out okay. Stitt has strict recruiting requirements at Mines, where academic success is a must. This would be a great hire. Robb Akey is the former Idaho Vandals head coach and the current defensive line coach for the Minnesota Vikings. Akey was a defensive lineman for Weber State in the 80s. Following that he had stints at Washington State, Northern Arizona, and Idaho. Akey was an all-Big Sky selection at DE his senior year. Akey piled up a 20-50 record with Idaho during his tenure as head coach. In his best season the Vandals finished at 8-5 and had a win in the Humanitarian Bowl. Akey could not recreate that success and was eventually ousted. You might be reading this and thinking, why on Earth is this guy considered head coach material? Well, easy. What would Akey do coaching a team that’s elite in their own division of football vs being a coach to a very unsuccessful FBS program with a large Pac12 school only eight miles away? I’m not convinced that Akey was the problem at Idaho.. I think Idaho was the problem for his lack of success. An interesting candidate to consider and has plenty of ties to the Pacific Northwest, so recruiting shouldn’t be too much of an issue. Beau Baldwin is the current head coach at Eastern Washington. Many Griz fans are familiar with Baldwin being on the opposite sidelines and handing out a few losses to the guys in maroon. Baldwin was a quarterback for Central Washington in the 90s, Jon Kitna was one of his quarterbacks he coached. After coaching QBs at Central Washington he went on to be offensive coordinator for Eastern Washington. In 2007 he was named head coach at Central Washington and made a quarterfinal appearance in the playoffs, losing to Grand Valley State. Since then Baldwin has coached at Eastern Washington. While at Eastern he won the 2010 national championship. Baldwin seems like a slam-dunk as a candidate of the Griz. He knows the area, he knows the program, and he can coach quarterbacks. After losing a four year starter in Jordan Johnson the Griz will be breaking in a new quarterback and who better to groom a QB than Beau Baldwin. Undoubtedly the facilities, fan base, support, and tradition are much better at Montana. Imagine what Baldwin could do with all of that in his favor. The big question here.. can Haslam lure Baldwin away from Eastern Washington? Seems unlikely, but hey, worth a call, right? This would be the best hire for UM, in my opinion, but would be difficult to pull off. So there you have it, Griz nation, this is our list of head coach candidates. Kent Haslam, if you’re reading this (which we know how much you love reading eGriz for advice) all we ask is that if you select one of our candidates hook us up with some sideline passes and maybe name part of the new athletic center after us. That’s not too much to ask for this free scouting report and advice, right? Pease. Please don’t let this opportunity pass us up again. Needs to be someone who has been at least an assistant at an FBS level school for 10 years or more. Montana needs someone who can recruit and compete once again with teams like NDSU and EWU. If Pease wants it, he’s gotta be the choice. Grady Bennett !!! No need to say anything more!!! Why hasn’t Scott Gragg’s name been mentioned at all? Pete Carrol then. The Seahawks won’t make the playoffs. Hahaha… Neither will the niners but keep Harbaugh away from the Griz! Lance Leipold 102-6, won 100 faster than any coach in college football history. 5 national championships in 7 years, they are 10-0 this season and ranked #1. I hear Marty Morninweg is building a house in Missoula. Don’t think they can afford him or Dave Dickenson though. Cheap b…..ds! Who calls the plays all season that has everyone screaming mad? Scott Gragg! Ooh. Good point. I just like the guy tho. Not a matter of hope. Need to be a perennial contender for the title. I’m with you. The people in there now have produced nothing but boring Grizzles to watch. We need some new blood to get this team energized. Lance Leipold would have been a great choice, but he just signed with U of Buffalo. Obviously a great coach, but probably wouldn’t have had enough recruiting clout in this part of the country. Gregorak will probably be a finalist even though he wasn’t listed as a choice in the article. If he isn’t given the job I do hope the new coach will keep him on as DC.